Pour some warm water in a small bowl, and add some mild dish-washing soap. Dip a soft, lint-free cloth in the soapy water, and then gently wipe the stainless steel jewelry with the damp cloth until the piece is clean. Wipe the remaining soap off your jewelry using a moist cloth dipped in clean water. Dry the jewelry well with a clean towel, and then leave your pieces to air dry. 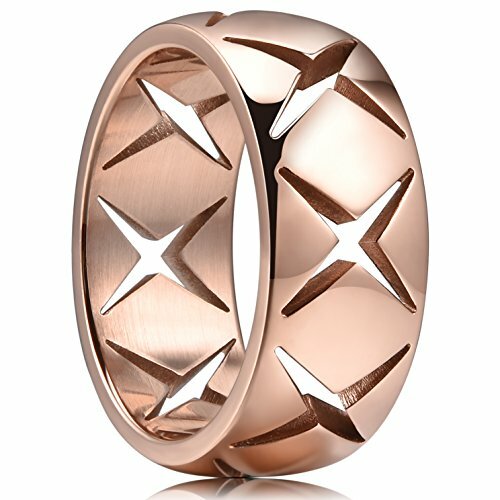 King Will's new special design series,curved with cross hollow and polished rose gold surface. Made from 316 stainless steel,which guarantees high strength and hardness. Perfect 8mm width band both for men and women.